In 2001, a startling discovery was made in Brno during a survey of catacombs under the center of the city. Although disturbed by underground water and mud, the remains of 50,000 people were found stuffed in a small room. The room was floor to ceiling with the skeletal remains of the City’s former inhabitants. After restoration work, the Brno Ossuary was opened to the public in 2012 ands is the second largest Ossuary in Europe after the Paris catacombs. So how did they get there? In the 16th and 17th Century, due to cholera, the Plague, war and so on, people tended to die in large number s periodically. They were buried in the churchyard near the Church of St. James inside the city walls however, to cater for such numbers in a limited space, they were dug up again several years later and the remains stored in the crypt of the church. Their graves were then occupied or perhaps we should say ‘rented’ by the newly dead who would be moved 12-years or so later. Eventually, due to health reasons, the churchyard was closed and all the bodies moved to the crypt as well. During this time, the crypt had to be expanded and made larger to hold all of the remains of what is estimated to be 50,000 souls. 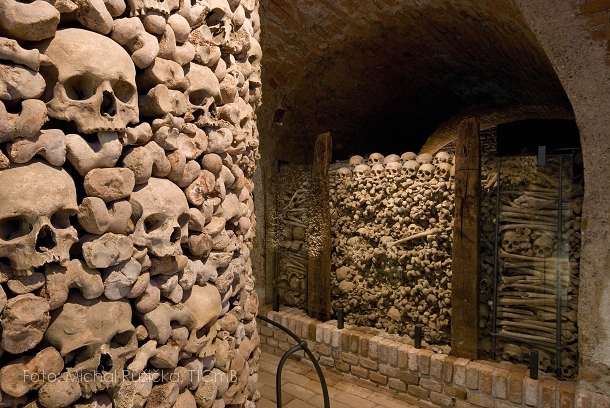 You can visit the Brno Ossuary and see the remains for yourself if you dare. I can tell you this, it is creepy and the thought of constantly digging up bodies and placing them in the crypt is pretty freaky too.